Start your day with the right nutrients. Many studies prove the value of a well-round breakfast to keep your mind sharp and boost your metabolism for a strong start to the day. Your blood sugar is depleted when you wake up, and when you skip breakfast, your body goes into “famine” mode, fearing there will not be enough calories to fuel your body for the day and forcing it to conserve. Further, you may become so famished by lunch that you make poor meal choices (think of being “hangry”!). Plan meals ahead of time so you aren’t scrounging through the fridge hungry. You can take advantage of produce in season, prepping it ahead of time. When you arrive home hungry, the process of making the evening meal is made easier when you already know what you are going to cook and some of the food preparation is already done. Additionally, easy pre-planned meals allow younger family members to help cook meals and increase their abilities (and willingness) to help. 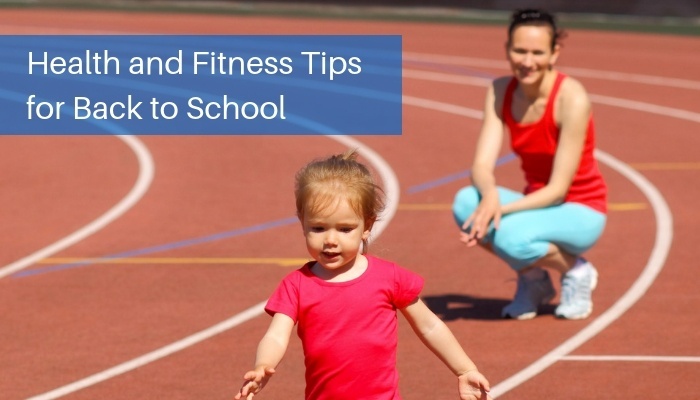 Once the kids are back in school, you may not be able to maintain your summer workout time. If you can no longer squeeze an early morning routine, what about right after school? If your goal is to train for a fitness event as a family, try to find a time when all family members will have enough energy to devote to the routine. Design a realistic schedule you can stick with. Time management is an important skill. If you want to maintain a workout routine just for yourself, consider an evening schedule after the kids’ bedtime when you can focus on yourself. Don’t feel guilty about setting aside 30, 45, 60 minutes each day for yourself— “me” time reduces your stress, allowing you to give more to your family too! Let’s face it; often people are blinded by a shiny new fitness tracker, but don’t fully understand how to use it, and use it effectively. A fitness tracker is not a magic wand, but it CAN be used to improve your success rate. Establish personalized goals (don’t just use what the default choices are on the device), providing yourself with stepping stones, or small regular milestones, which you can celebrate as you reach them. Create small rewards, both for your periodic goals, and for the time you either reach a major goal or participate in a specific event. Once school starts, its easy to get back into the long hours of sitting at a computer. Studies have shown that extended periods of sitting slow down metabolism, increase cardiovascular problems, and increase the risk of obesity. Consider a standing desk; inexpensive options to mount on a tabletop can provide you with some variety in your working positions. Standing burns more calories than sitting; an anti-fatigue mat helps keep the spine in correct alignment and massages the feet (especially when barefoot). Track how much time you are sitting over a week; commit to make a drastic improvement in that time and see how much better you feel! Prepare for wet fall and winter weather by adding weights to your routine. Once everyone returns to the school routine, you may find it a struggle to make it to the gym regularly. Consider putting your own home gym together with equipment you can manage outside of a large facility. Resistance training can start with using your own body weight, and you can add resistance bands and free weights as your fitness level and strength increase. Additionally, having equipment at home allows you to tackle longer workouts without the added driving time. One easy addition to your back-to-school fitness routine is respiratory muscle training. Weak respiratory muscles inhibit you from making greater fitness gains. A stronger respiratory system equates to better lung function, more effective muscle performance and recovery, and a reduction in the feeling of breathlessness. When looking for tools to help you improve your health during back to school season, consider the PowerLung device. This portable respiratory muscle trainer can be added to your training program, used anywhere, and short 10-minute exercises can be a convenient addition to improving your health!